New York Times bestseller Scythe, out now. 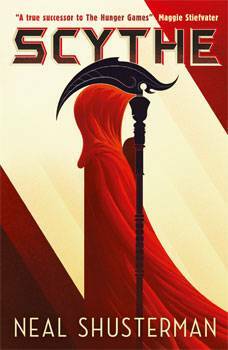 Scythe is the first book in Shusterman's fantastic new dystopian series the Arc of a Scythe and has been on the New York Times bestseller list for 11 Weeks. Scythe will be published in Australia and New Zealand in February 2018 and the sequel, Thunderhead, will follow in August 2018. Since its publication in 2016, Scythe has been highly acclaimed in the US and Universal has already snapped up the movie rights. As well as being on the New York Times bestseller list, Scythe was a Publishers Weekly Best Book of 2016, winner of a Michael L. Printz Honor in 2017, was recently number two on the Young Adult Library Services 2017 Teens' Top 10 list of books as voted by teenagers across America, and has received multiple five starred reviews. Scythe is a dark, gripping and witty thriller in which the only thing humanity has control over is death. It is based in a future where disease, war and crime have been eliminated, and the only way to die is to be randomly killed ('gleaned") by professional scythes. Citra and Rowan are teenagers who have been selected to be scythes' apprentices, and despite wanting nothing to do with the vocation, they must learn the art of killing and understand the necessity of what they do.